The Best Looking Custom Cover For Your Metal Baseboard Heaters That You Will Find Anywhere!! Custom Wood Baseboard Heater Covers from Sunrise Woodwork are easy to install, come in several styles and finishes and look better than anything else you will find. The order form on this web page is designed to allow you to specify all your choices easily, as well as receive a price for your unique needs, and to place your custom order quickly. All orders include an interactive instruction Booklet via download, as well as a Printer Friendly version. If you have any questions please do not hesitate to contact me, or use the Get Information form below. I will do all I can to help. You have a number of choices when ordering your custom made baseboard heater cover,and there are a number of details specific to your needs that you must specify. But do not be intimidated! It is important that you understand the questions and take the time to determine the correct answers before placing your order. This is a custom order based on your input, and we cannot be responsible if your covers do not fit because you did not order the correct size. Each Heater Cover should have its own name or number to identify it. This makes it easy for you to know what goes where when your order arrives, and it helps me keep track of things in the shop as well. For instance, If you have 3 heater covers going into your Living Room you could name them : Living Room 1, Living Room 2, and Living Room 3. If you have heater covers going into different rooms you could name them Living Room, Dining Room, Kitchen etc. What Style of Cover Do You Want? You can pick from several styles of baseboard heater cover. Choose the design that appeals to you. Also, The standard heater covers vent from the top. If your existing metal cover has a large solid top more than 2" deep off the wall that may block air flow, and you and you do not want to remove the metal covers entirely then you may need a cover that vents from the front instead of the top. Let me know and I can alter the design to suit your needs. Our Custom wood heater covers are available in several choices of materials and finish. You can choose to have it sent to you sanded, but unfinished, and ready for paint. Save money by applying the primer and color of your choice yourself. Primed covers are given 4 coats of sanded primer for a beautiful and smooth surface, ready for your final color. In addition to 4 coats of sanded primer, the heater covers receive 2 final coats of satin white for a beautiful finish. The top and front of the Heater cover are made with pine, given a medium stain and mildly distressed and aged look, then finished with clear lacquer. The hardwood covers are sprayed with 5 coats of clear satin lacquer for a beautiful and durable finish that really shows off the beauty of the wood. Specify whether the Right End and Left End are Open or closed. If the metal baseboard meets a wall on the left or right end then you should enter an "open end" detail for that end. How Are Your Walls Laid Out? In the section labeled Wall Layout in the order form below, click on the picture that matches the layout of your walls. After you make your selection the appropriate fields will open below it for you to enter the length of the walls. Take extra care if you are ordering a heater cover for an odd niche, or under a Bay window. Click on the section for Bay Windows for more information. Our heater covers look amazing under a bay window. If you are ordering a baseboard heater cover to fit under a bay window, take a few minutes to determine the correct details so that your covers will fit properly. In particular you need to determine 2 things. 1 . After you choose the style of heater cover and the material or finish you want on the order form, Browse the "Wall Layout" section and Choose the wall layout that matches your needs. This will open the correct lines for you to enter the length of the walls that will be covered by your new heater cover. 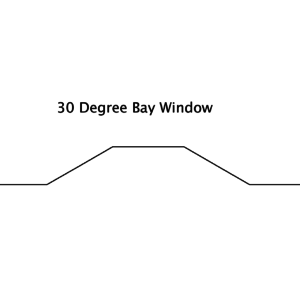 The baseboard heat in your bay window may be laid out in a number of ways. I have given selections for all the common scenarios. If you do not see a good fit for your needs use the information request form below to let me know, I will work with you to quickly design a solution for you. 2 . 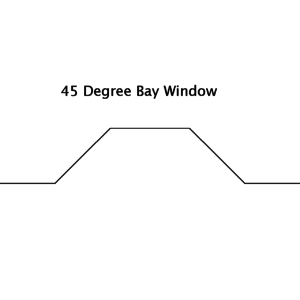 Determine if your bay window has 30 degree angle walls or 45 degree angle walls. Click the buttons to download and print drawings which you can use to determine which type of bay window you have. Length of New Heater Covers? for the thickness of the end cap. After you choose your wall layout on the order form, the appropriate fields will open for you to enter the length of your walls. if the end of the metal cover does not meet a wall, but instead meets your wooden base moulding (a closed end detail) measure to the edge of the base moulding. The easiest way to do this is to slide the end cap on the metal cover up against the wooden baseboard moulding and measure to the end of the metal end cap. 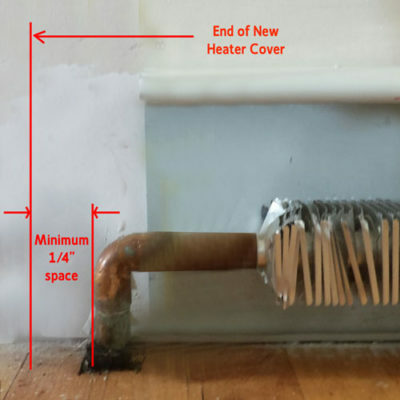 The CLOSED END CAPS on the new wooden heater covers are thicker than the existing metal covers and require a space of at least 1/4" between the side of the heat pipe and the wood base moulding. If you do not have the minimum space you will need to trim the wooden base moulding to allow the end caps to fit. A space of 3/8" to 1/2" is ideal. After you trim the base moulding to allow for the end cap, slide the metal cap up against the wood base moulding and measure the new length which includes the space. Another option is to cut a notch the in the side of the endcap so it can be laid over your moulding. If you tell me the size of the notch you need, I will cut it for you. How Tall Should the Heater Cover Be? Enter the height in inches from the floor to the top of the existing metal heater cover. Enter the height as a decimal. I will add 1/4" to this number so there is a little space between the metal cover and the bottom of the new wood heater cover. Measure the height in several places and enter the greatest height. How Deep Should the Heater Cover Be? Enter the distance in inches from the wall to the front of the metal heat fins. I will add 1/4" to the number you give me to add a little space between the metal fins and the wood heater cover. Measure the depth in several places and enter the greatest depth. After adding the details of your order in the order form, click the "Add to Cart Button"
You will be taken to your shopping Cart and you can verify the details as well as see the shipping cost for your order. If you are not taken to your shopping cart after clicking "add to Cart" take a look at your order form again, some fields are required and if you forget to enter a choice the form will not go to your cart until you correct it. They will be highlighted in red. If you want to order more than one heater cover click the back button in your browser, or the product image in your shopping cart order details, to return to the product order form, then enter the details for your next heater cover and add it to your cart, the same way as the first cover. You can order any number of Heater Covers on the same order. However, they must be added to the shopping cart one at a time. click the back button in your browser or the product image to return to the product order form, then enter the details for your next heater cover and add it to your cart, the same way as the first cover. Our Wooden Baseboard Heater covers can be made any length, but for shipping purposes they are made in sections up to 47" long. The heater covers are easily joined together on site. If you are near enough to our shop in Warwick NY, you can select local pickup as a shipping option in the shopping cart and you will not be charged shipping. Contact me and make arrangements to pick up your order when it is ready. Heater Covers from Sunrise Woodwork are easy to install. The cover can be made to any length by joining sections together.Normally they slide right on top of the back plate of your existing metal cover. If your metal covers have been removed, no worries. Just let me know and I will set you up with another way to install your new covers. You can use the form below to ask a general question, submit a comment or get help with a special project. This form makes it easy to ask for help with an unusual project that does not seem to fit into the order form easily. You can send photos or files to help explain things. On the bottom of the form you can enter your project details and get an instant online quote without placing an order. After you click the "Submit Info" button you will receive and email with a copy of the form information for your records. Looks great, would love to get more info. also, please feel free to phone me at 845.987.0580 and I will be glad to help any way I can. Measure in several places and give me the largest dimension – measurement you see. I will add 1/4″ to the number you give me, that will be the dimension for the depth inside your heater cover. Tried three times to order from another online company with no response, I emailed Tom late and night with a question and he answered within an hour. Right there he secured my business. I ordered an unprimed custom 94” baseboard cover and it arrived in less than two weeks. I have to admit I love the look, and I’m thrilled to have a product that won’t rust in the bathroom. I have, and will continue to recommend this product to anyone in need of quality baseboard heaters. I would love to share pictures if I knew how to. Thank you Colleen for taking a moment to let me know that you are so pleased with your purchase. I work hard to make the heater covers the best they can be, and it really does make me feel good to know that you are happy. You have given me food for thought, it would be great if you could submit a photo of your heater cover with your comment. I will have to look into that. I am not sure if it can be done. In the mean time you could send it to me either from my contact page or within the “get more information form” right on the heater cover order page. Sign me up for insider offers! If you have already purchased and installed a custom wood baseboard heater cover from Sunrise Woodwork you can share your story online by submitting your photos and comments here. Tom was great to work with. He produced a quality product to my exact measurements with a great finish. He also saved me when he repaired a piece that I damaged during installation. After the repairs you couldn't see where the damage had been. I wouldn't hesitate to recommend Tom's services or this product.